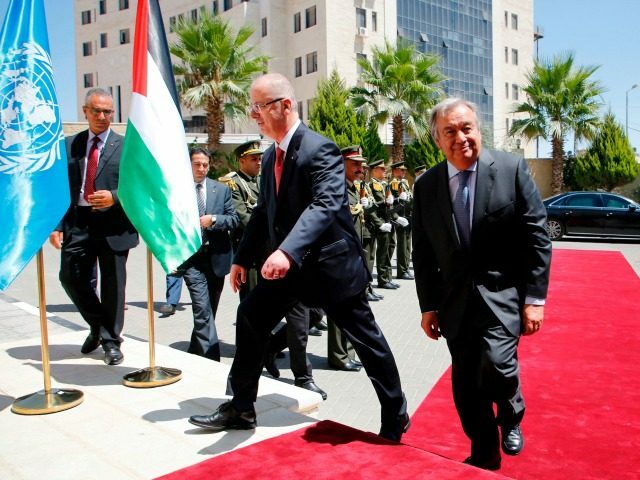 1 – Guterres promoted the failed so-called two-state solution. 2 – Guterres wrongly assumes that there is a Palestinian partner for peace. The Al Aqsa Martyrs Brigade, a terrorist group responsible for scores of suicide bombings and deadly shooting attacks, is closely aligned with Abbas’s Fatah party and is routinely referred to as Fatah’s so-called military wing. Only yesterday, Abbas exclaimed that he would continue official PA payments to convicted terrorists “until my dying day.” Earlier this month, it was reported that the PA’s 2017 budget for payments to terrorists and their families amounts to about half of all foreign aid the PA expects to receive this year. Abbas’s official PA organs and media outlets routinely glorify murderous terrorists. Breitbart Jerusalem recently reported on a Fatah summer camp named after Dalal Mughrabi, who led the 1978 Coastal Road massacre in which 38 people — including 13 children – were murdered. 3 – A Palestinian state would be at war with Israel and would not advance moderate interests. The very basis for Guterres’s efforts to create a Palestinian state are flawed. There is no significant evidence to suggest that such a state would be moderate and a force against regional radicalism. The ailing 82-year-old Abbas, meanwhile, is unpopular and hasn’t held a presidential election since 2005. He is at odds with Hamas and a slew of other radical Palestinian factions that are either outright terrorist groups or support terror ideology. Hamas itself is under threat by the even more extremist Islamic State. There is no known moderate Palestinian leader or political party viewed as capable of taking over the PA. Indeed, there is no known moderate leader in any senior position in the Palestinian arena. 4 – Guterres promoted the falsehood that settlements are an impediment to peace. The reference to “settlement building” has become so routine that few notice the anti-Semitic undertones of singling out Jewish construction, promoting the concept that Jews should not be allowed to build in certain territories. The idea that “settlements” are an impediment to peace is contradicted by history. In 1948, even before Israel controlled the areas referred to as “settlements,” Arab states formed a coalition and went to war to destroy the newly established state of Israel. If “settlements” were the obstacle, then why did the PA fail to respond to Netanyahu’s unprecedented attempts to jump-start negotiations aimed at creating a Palestinian state, including the freezing of Jewish construction in the West Bank and eastern Jerusalem? United Nations Security Council Resolution 242 calls on Israel to withdraw under a future final-status solution “from territories occupied” as a result of the 1967 Six Day War. The resolution does not call for a withdrawal from “all territories,” a designation deliberately left out to ensure Israel’s ability to retain some territory for security purposes under a future deal. Article 49 of the Fourth Geneva Conventions, which is relied upon by those who claim the settlements are illegal, does not apply in the case of the West Bank. This is because the West Bank was never under self-rule by a nation that was a party to the Convention, and therefore there is no “partial or total occupation of the territory of a High Contracting Party,” as Article 2 of the Convention specifies. Moreover, even if it did apply, by its plain terms, it applies only to forcible transfers, and not to voluntary movement. Therefore, it can’t prohibit Jews from choosing to move to areas of great historical and religious significance to them. 6 – Guterres ignored rampant illegal Palestinian construction. Guterres’s statements about Israeli settlements, which Israel maintains are not illegal but disputed, ignores undisputedly rampant illegal Palestinian construction taking place in key areas of eastern Jerusalem.